Since my plum seat assignment at the stage play that I idiotically volunteer ushered on Saturday was a choice between sitting next to the production’s director or an extremely intimidating theater critic, I decided that it was wise that I resisted the urge to tape a bulky radio to my person so I could discreetly listen to the men’s US Open tennis semi-final that was being played at that exact moment between Rafael Nadal and Mikhail Youzhny. I also made the wise choice of sitting next to the director. Fifteen minutes into the first act, I suffered an uncontrollable coughing fit that lasted about a minute, but seemed more like an hour. If I could have pressed a button that would have sent my seat freefalling through the floor, I would have done so in a heartbeat. Had I experienced that embarrassing display of hacking next to the sour critic, he surely would have thrown me through the wall. Afterward, I apologized profusely to the director. To her credit, she was gracious about my disruption. I was relieved that she did not ask me my opinion of the play. This was probably due to the fact that I applauded it with the level of enthusiasm I would reserve for attending a taping of the Late Show with David Letterman if Jesus Christ were the guest; this zeal probably led her to believe that I thought this play was pure genius. In actuality, what I was applauding with gusto was the fact that this painfully underwritten jumble of pointless scenes had finally come to an end and I was free to bolt and watch tennis. Since Rafa had annihilated Youzhny in straight sets that took a little over two hours, by the time I was once again planted in front of my TV, Roger Federer was already halfway through his five set losing battle against Novak Djokovic. Although I was disappointed with the end result, Novak played his heart out, and Roger fell short. The guy that played better won, but it is depressing that the long anticipated showdown between Roger and Rafa has yet to happen in the US. I imagine that some members of the GOP will blame Obama for that, too. That evening, Milton and I were on the phone throughout the women’s final, the boring rout between Kim Clijsters and Vera Zvonareva, since Zvonareva failed to attend the match with her game. 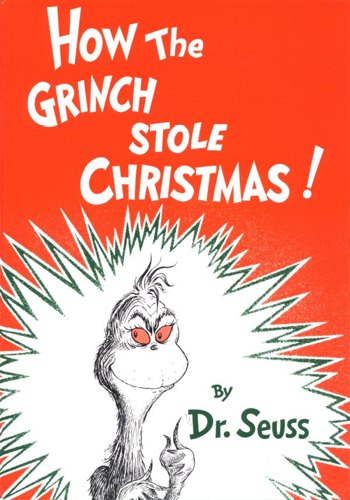 Milton dryly observed that Zvonareva looks like the Grinch. Vera Zvonareva flaunting her tan lines. Vera Zvonareva's doppelgänger per Milton. On Sunday, Milton and I were on the phone again, waiting for the men’s final, but CBS continued to broadcast football well past the scheduled 4 pm start time since it was raining steadily over in Flushing Meadow, the home of the Billie Jean King National Tennis Center. It would be a sadistic two hours before the USTA would announce that the match had been postponed. Therefore, Milton and I were on the phone watching football and waiting in vain for tennis. Milton hates football. He thinks it’s the sport that epitomizes everything that is stupid about members of his own gender. I grew up watching it, so I can easily get into it, but if you have never been a follower of this sport, it can appear to be twenty-two beefy guys crashing into each other all over the place as the ball is flung in the air or squirting around on the field. Since the game we were watching was the Jacksonville Jaguars playing the Denver Broncos, Milton had a meltdown over a few Jacksonville players, specifically the cornerback Rashean Mathis and the guard Uche Nwaneri. Both players have very long hair spilling out of their helmets. Milton thinks it’s hypocritical that in a sport so macho that so many players have hair extensions that require primping. 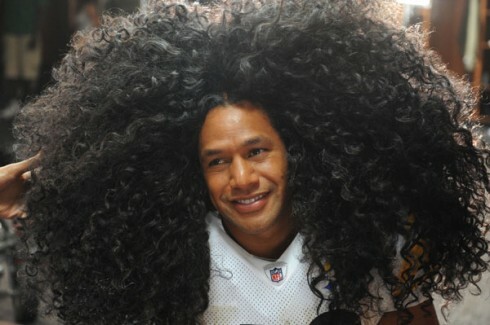 Until that moment, I never put any thought into any NFL player’s hair other than that of Pittsburgh Steeler’s safety Troy Polamalu. Since he’s insured his hair for a million dollars, I’m confident that his mane, which he has not cut since 2000, is genuine. As for whether the crowning glory of Rashean Mathis and Uche Nwaneri is real or fake, considering how big and strong they are if I ever met them I doubt I’d pop that question. I’d applaud them both with gusto and continue to hope for clear skies for Monday’s men’s tennis final. This entry was posted in Humor and tagged hair, hair extensions, the grinch, the nfl, troy polamalu, us open tennis, vera zvonareva. Bookmark the permalink.